THE INAUGURATION HASN’T TAKEN PLACE YET!!! And if these people keep rioting we’ll have Marshall law. It’s all scripted and if that happens there certainly won’t be an inauguration. Is this a color Revolution as suggested by Wayne Madsen in his article titled “George Soros and his Sorosite minions wasted no time in launching their “color revolution” for the United States. ” Or is it just politics as suggested by Stephen Cohen during his interview on RT. WayneMadsen states in his article the numerous events where a color revolution has taken place around the world and suggests that it is now happening here in the US. In the interview with Stephen Cohen he explains that the Electoral College can only be abolished by a Constitutional Amendment and though he glossed over how the Electoral College became a part of the Constitution due to the fact that the Slave Owner States felt they were less represented compared to the heavily populated northern states, I would like to add, that had those Slave owners counted their total population, including the millions of Africans they would have had a fighting chance, but I digress. When I was in school, I attended catholic school thru to college, they would always make us feel bad about not being observant and not asking questions when we were in class. Of course, being a student in a Catholic Institution that was and probably still is clearly racist, me, as a young person didn’t see it as racist when our all educators were white nuns and priests. I simply took it to heart and challenged myself to be able to come up with a question, about anything I was being taught. I remember sitting in class being the only one with my hand up to ask a question. When I couldn’t think of one immediately, I would rack my brain until I did. Over time, I became my teachers favorite student for my participation in class, but also I became my teacher’s most feared student. They saw me question almost everything. To this day, I remember asking Sister Whatever her name was…. How is the electoral college fair? We were studying American Government in 11th grade and I remember her face, that day, where I was sitting in class and her response. She had spent the entire class parroting how wonderful Democracy was and how everyone had the right to vote and the vote was their voice in the electoral process, one vote, one voice. 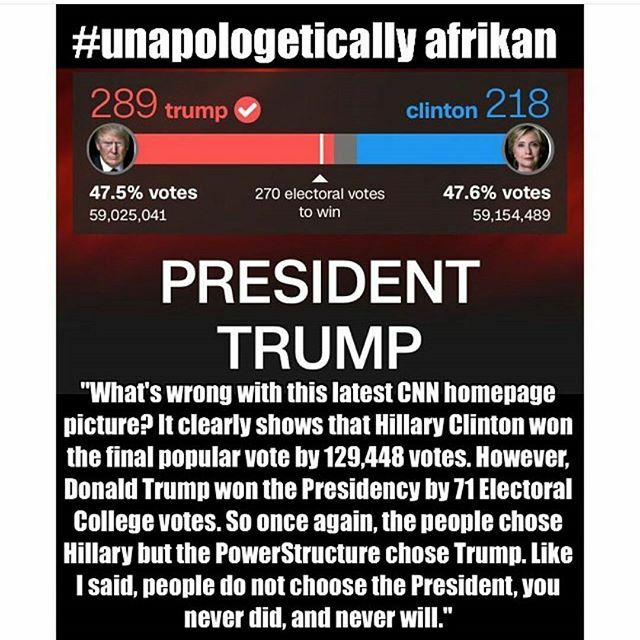 But when we got to the electoral college she was flabbergasted that I would question its authenticity and now that I look back on it, since she too was probably as brainwashed as the rest of us, she herself, didn’t even know it had to do with the Southern Slave Owners wanting to get a fair chance at voting. Heck, I just found that out during my adult life myself. Which just shows to go you that what we learn in school as so -called history, politics, economics, etc. are really all parroting what somebody told them that somebody told them and so on. The debate over the electoral college is long overdue. It has no relevance in today’s society and does tend to give the edge where it should not. It overrides the popular vote but has only been seriously contested in the 2000 election, which when presented before the Supreme court, they went with the Electoral College vote that gave us four years of GW Bush. Lord Have mercy. Do they really want the electoral voters to go rogue? Do they want to set this precedent? Are they really ready for the aftermath of that turn of events? Are they really ready for a Constitutional Amendment that will abolish the Electoral College and have one man/one vote. If in the final analysis they can convince Florida to change their vote to Hillary, then the constitution will certainly be in crisis. Like in 2008 when they elected Obama with little or no experience and a mysterious background. If they do that, how does that look? Go single out one state to change its vote? What about the other states that went Republic but had to give their vote to the Dems. What about the one man one vote? I really doubt that will happen, that’s a blatant interference with the electoral process. The Clinton’s have money and they can buy some folks off, but even if they did a recount it would expose election fraud on both sides but moreso with the Clinton campaign and the DNC and not to mention Wikileaks where even the mainstream media is referring to. These young people are not informed voters. They are all puppets in the hands of the puppet masters who rule the leaders and the followers. They really need to take a course in US Government that analyses it authenticity and its viability. They need to see who really creates policy. They need to take the blinders off and face the fact that one man/one vote means nothing after the election when they have corporate lobbyist who make 6 figures lobbying for the bankers and corporations for the purpose of getting policies enacted that will be in their best interests. Look around. 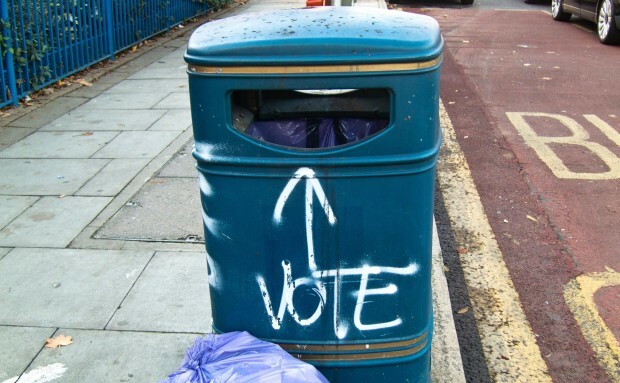 How many times have you heard people complain about what they DID NOT VOTE FOR, but what is happening anyway. Why? Because one man/one vote does not add up to cash in the bank accounts of the elected officials. One lobbyist does…. I must admit that things are shifting. There is infighting among the elite. The Soros gang against the Kissinger gang. Each wanting to control the Universe. Fighting over the planet like their Ancestors have been doing for millennia. People are so divided as well. I am working on a reading on this. Some say he will be assassinated or die after a couple years in office. Hillary is on her deathbed and has proven more of a liability than an asset to her handlers with all her scandals exposed. Trump will have to bite the bullet, go along to get along and part of that is to pardon Hillary. Obama could Pardon her but that would be an admission of guilt. If Trump does that will be an olive branch to her supporters but a green light to others in the hidden cabal of criminality and pedophilia. The Powers that shouldn’t be have gotten themselves in a cross-hairs of Biblical proportions and the rest of us just want to have a decent life, feed and educate our families, have clean air and fresh water, non GMO foods and simple moments with nature. 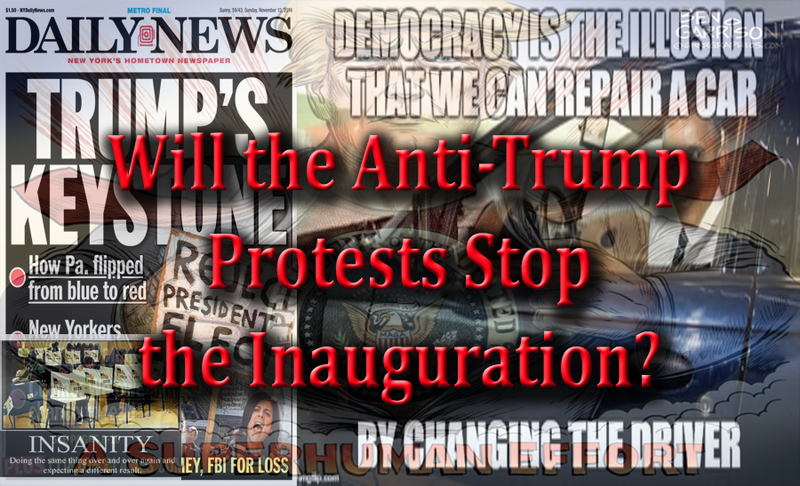 Thousands have already signed up for a Jan. 20 protest in downtown D.C.
Donald Trump will be the 45th president of the United States of America. Following his defeat of Democratic candidate Hillary Clinton, the Republican is set to replace Barack Obama in Washington, D.C., on Friday, Jan. 20, 2017. What can we expect from the proceedings and how will the pop culture world respond? In the rush for inclusion in America, the election of the first Black President represented the apex of success to some. The folly of that has fallen to the level that Blacks’ major political pursuit is maintenance of the status quo and Obama as President. In their moves to be mainstream, Blacks now eagerly accept second-class American status. If you look at any social index, Blacks have much to complain about. Not just this Democratic administration but most political administrations over the years have ignored Blacks and their political needs. Black activists must be brainwashed or blind not to see legacies of institutional racism and discrimination in housing, education, policing, criminal justice and employment that continue under Obama’s presidency. The average African-American income is $33,916, compared with $54,920 for Whites. Conservative Republican Congressman Allen West offers a different slant on “who is brainwashing whom” by citing Black Americans’ disregard of the 16.7% unemployment rate in Black communities, 20% unemployment rate for Black adult males and 45% unemployment for Black teenagers under the Obama administration. 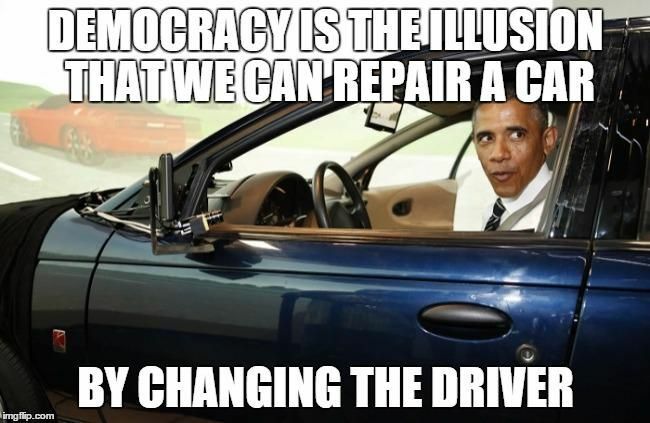 “The Illusion of Democracy” is a more accurate history of the United States since the coup of 1963, when President Kennedy was executed in Dealey Plaza. This sequel focuses on the political side. It explains Hegelian Principles and how our puppet masters create conflict to increase their wealth and power while controlling the media through Operation Mockingbird. It connects the dots of all major false flag events to prove this massive deception has been intentionally engineered to subjugate our nation to indentured servitude in a feudal system controlled by wealthy oligarchs. This book was written at a high school level with those students in mind. It is perfect for high school classes, college courses, or the average reader at home who is curious about what went wrong over the past generation which killed the American Dream. Will President Obama pardon Hillary Clinton of all the various criminal acts she has been accused of during the 2016 election? Can the White House pardon Hillary before an indictment? If Obama takes no action, is Hillary Clinton guilty of treason as some claim? If so, will Donald Trump prosecute Hillary and order the FBI to have Hillary arrested?